Bill you bring up the opening of the tin house, sadly I remember the day well. Was working the 9x6 that day in 50. L19 had building inspection that day. Wanting to insure trucks available during those days when the truck in qtrs had building inspection (1000-1300) they would use the engine in qtrs for the inspections with the engine officer and men manning the truck for the period. There was a big ceremony at the tin house for the opening. The Mayor, Fire Commissioner, Chief of Department, brass etc, were in attendance. 85 and 59 were OOS for the ceremony. Was around 1030 or so we get a first due box, we (L19) respond. We pull up to the building and we have a heavy smoke condition from a 3rd floor apartment. The only person on the street was a young woman screaming at us that her baby was in the apartment. I gave an "urgent" over the apparatus radio if not 3 times at least twice with no dispatcher response back. Can't wait, into the building to the apartment. We force the door and the fire blows out into the public hallway. We (myself, irons and can man) go in low (nose rubbing on the apartment floor) but we could only make about 10 feet in for a fast search. 19 arrives on the floor with the line. We swap and give the truck guys their tools and we (50) take the line in and put out the fire. In the last room we find the baby, one years old the day before. His body looked like the ash on the end of a cigarette with 4 bumps where his arms and legs were. The best of times, this was the worst of times. 85 and 59 would have been first due. At hi-rise operations the FDNY has three command positions. The Operation Command on the floor below the fire floor, Staging Command two floor below the fire floor and the Lobby Command. Next month will be the 26th anniversary of the first World Trade Center attack 2/93. My assignment that day was Lobby Command South Tower. There was no Operations or Staging floor that day as there was no fire on the upper floors. The only floor we designated for assignment was a floor around the 60th floor for Triage. With no power/lights in the tower this floor was under renovation with the floor empty of partitions etc. and the windows gave us some light for treatment. This floor was used to treat people in need above the 60th floor and the lobby for triage for people below the 60th. The main concern in the South tower was to find and rescue people trapped in their offices and those in the stopped elevators. The office search was fairly easy and routine. We obtained master keys from building management. Truck companies were sent up to the top and middle floors to begin the search and evacuation. I can write it was easy as I didn't have to climb 100+ floors in stairwells without lights. I remember L111 reporting to me right after I had received word that a woman had fallen on the stairs on the 80th floor and broke her leg, she needed to be carried down to the lobby for hospital evacuation. The Lt. from 111 reported in and asked me if I had an assignment for him. I said "yeah, a woman just fell and broke her leg on the 80th floor. Go up there and carry her down to one of the ambulances outside." He just said "yes sir," and started up. Had to be well over an hour later that they carried her out of the stairwell and to the ambulance. The main problem was the elevators. Each tower North and South had 99 elevators with pretty much all stuck between floors packed in with no lights. One elevator had over 60 school children and teachers. It took over 6 hours to free the children and teachers. Walls were breached for removal and many heroic acts were performed by the members breaching elevator doors and climbing down to the top of the stopped elevators to remove the people through the roof hatch. I left the scene around 9PM after the last elevator was found searched and the trapped removed. I was told that day that the truck bomb was meant to bring the towers down. I thought that if they had they would have killed thousands. I retired in 1997. Like millions of others I watched the 9/11 attack unfold on the television. With me watching was my son who was a Nassau County Police Officer. When the South Tower fell I turned to him and said "you just saw 100 firefighters die." God bless them and may the 343 and those after that day continue to Rest in Peace. Chief - Thank You once again for telling us your story. A few of us on this site have discussed how valuable your stories, as well as other stories from members of the department are so very important and should always remain in the history of the FDNY. Who many consider; "The Greatest Fire Department in the United States and perhaps the World". As I relate to the history of the FDNY, I realize how many changes and operating policies actually began within the FDNY. If there was ever a place in this country that the rest of the fire service could learn from, it is the New York City Fire Department. Within the boundaries of that city is every type of fire incident or emergency that any city must deal with. Chief, for our younger members of this site who may not remember the WTC Bombing of 1993, this is how it was. Every working fire (one or more rooms involved on arrival) is a danger to the occupants and responding/arriving firefighters. Firefighters survival/safety (I feel) is based on 10%equipment, 10% training, 30% experience and 50% luck. I was always thankfully amazed that more firefighters were not injured at working fires. One of my main concern at many jobs was as we were stretching up the stairs at tenement fires and the truck would take out the stair skylight glass the seemingly hundreds of glass shards raining down on the guys didn't cause more injuries. Looking back over the six years I spent as an engine officer I remember three "close calls." The first was my stupidity as I almost walked out of a 5th floor vacant building window looking for a breath of air after knocking down the apartment fire, only the wind blowing the remaining steam/smoke away and I saw lights below me that I stopped walking forward as this window was completely out down to the floor level. The second was a great call by a Deputy ordering us out of row frame building (we were first due engine, fire went to 3 alarms) and 4 or 5 minutes later the building collapsed. The 3rd was just pure luck. Working a night tour around 6AM we received a box for a building fire. The engine assignment on the box was 71, 50-2, 50-1 (with the two sections in 50 we alternated daily on which company was first up). On arrival we had a fire in a 4 story occupied tenement. It was an arson fire with heavy fire in a first floor apartment extending up the tenement stairs. 71 stretched and operated into the fire apartment. 50-2 was ordered to stretch into the exposure 2 building as the fire was threatening extension into the exposure. We were ordered to extinguish the stair/hall fires and to check the apartments above the fire apartment for extension. We hit the hall and stairs and worked our way up to the 2nd floor. We hit the 2nd floor hallway and then forced the apartment door of the apartment above the fire apartment. Quick occupant search we then found heavy fire in the apartment dumbwaiter extending around and out the dumbwaiter door. We hit the door and then the dumbwaiter. Left the apartment, hit the hall and stairs 2nd to 3rd floor, same op with the 3rd fl. apartment. We hit the hall and as we were advancing found a body laying in the hallway. I gave a quick HT urgent to the 6th Division and told him we had a 10-45 code 1 (deceased) in the 3rd floor hallway. The reason for the urgent was with the FDNY if there was a delay (more than 5 minutes) of a 10-45 announcement the chief (Deputy) would have to give a reason for the time delay in his fatal fire report required with every fire operation loss of life. The chief, DC Kelsey, RIP, asked me if I was sure it was a code 1, I responded that the body was 100% 3rd degree burned in the fetal position. The HT notification and getting around the body added probably 10 seconds to our advancement. We hit the hall and began to make the turn onto the 3rd to 4th floor stairs when the entire 4th to roof stair structure collapsed onto the 3rd to 4th stairs. We couldn't get past the collapse debris as it entirely blocked off the stairs. Another HT urgent to the 6th telling him we couldn't make it up to the 4th floor, they would have to stretch up the fire escape to reach this floor now. If it hadn't been for the ten seconds added by the body we would have been on the stairs, I doubt if myself and the 4 guys I had on the line would have survived the collapse. Luck? Sometimes I believe the good Lord looks after firefighters, who knows. It would be great if other firefighters reading this thread would post their own experiences at jobs, I for one would like to read them. Thank you for the post Turk. There are probably a hundred or more stories like yours out there. I turned 81 this past August, figured I would post what I remember, while I can, how the FDNY changed over my years. Masks- when I came on assigned 74 engine. My years there 74 was considered busy for engines, we were 9th,11th and 14th in workers my 3 years there, Workers were any job you went to work at, even doing a look see at a false alarm. We had around 900 workers my first year there, probably 30 to 40 structural workers with 40 hours of structural work for the year. Contrast that with 82's numbers e.g. July 1975 210 structural workers with 205 structural hours of work for the month. Assigned to 74 we carried 2 Scotts in suitcases on the rig. The main mask (one) was an MSA mask, a filter mask which couldn't be used in a cellar fire. But the MSA was a great mask for the nozzle man. There was no mandatory mask policy for the department until around 1986 or so I believe. I was a staff chief at the time masks became mandatory. Was a great move as with all the new construction material etc., plus reduced flash-over time. I never liked wearing a mask, found it to confining etc. Also as a new FF I had an experience with a mask that I guess stayed with me for my years. It was at the Times Tower fire in Manhattan. We went on the 5th alarm. When we got there my Captain Waldron was told to mask up and relieve on one of the 5 or 6 stretched lines. He and another FF did so and went into the tower. The fire if I remember right was 4 or 5 floors down, newsprint. Two firefighters had lost their lives, 24 truck, searching for trapped civilians. Ten or so minutes later Waldron came back out. I was given the mask with a fresh tank and told to relieve on a line. At that time there was no air gauge for the tank or a low air indicator alarm. The tank was rated at 20 minutes of air and you were supposed to "keep track" of how much air your had left. Now this may have been O K for apartment fire etc. but hairy when you have to go down 4 or 5 flights of stairs, fully smoke charged. I can remember being "scared" at 2 fires during my years, that was one of them. I went down, found 21/2" line and followed it to the nozzle. It was just me and the nozzle so I picked it up opened it up and threw water at smoke. A few minutes later another FF backed me up and then a few minutes after a chief came up to us and told us to shut down and go back up to the street. He didn't have to say it twice. In the coming years the MSA was gone and we carried the 5 Scotts. My years as a company officer in 50 and 82 I would have one guy my mask man if needed and call him up for usually a final push. My mask guy in 82 was Eddie Montaque RIP, an African American FF, a bull of a guy. I would yell "Eddie take the nozzle," he would crawl up, never hesitated, never failed. If the good Lord ever wants to put the fires of Hell out,he should just yell out "Eddie take the nozzle." Eddie Montaque RIP "Big Guy"
A couple of interesting things about the group photo above of an ECC training class from 1968, aside from Eddie Montague. A member in the photo from Engine 92 now has a son who is the Captain of Ladder 44. Another member in the photo from Engine 159, who later made Lieutenant, was rescued as a child from an ice house collapse and fire on Amsterdam Avenue in upper Manhattan. The vacant burning ice house collapsed on the adjacent tenement he lived in, causing its collapse. Finally, the member from Engine 92 (who finished first in that ECC class) ended his career in Engine 159. March comes in with St. Patrick's Day 17 days later. Two memories about St. Patrick's Day, one a beloved brother and the other a fire. As I have written my first day on the job was assigned to a fire company in the 6th Division, no training until our class would start in about a month. My first company was Ladder 19. Sat in the kitchen and just listened to the guys. They to a man were happy to have one of their guys back, FF1 James Corcoran. Jimmy had been out for several months due to injuries he received when operating at a job and the floor he was working on collapsed. Jimmy fell with the collapsed floor which then landed on and collapsed the floor below. Jimmy was one of those peole in life that when you met him you immediately liked him, the more you knew him the more you liked him. I spent about a month in the house, two weeks with 19 and then 2 weeks with 50 engine. Although our careers would bring us together, Big Jim Corcoran and I it would be another 10 years before I worked with 50/19 and Jimmy as a newly assigned Lieutenant in January 1970. Jimmy was then driving DC Kelsey (RIP) in the 6th Division. Our groups pretty much matched up (no 24's then) and I saw a lot of Jimmy. We became friends. Jimmy had a house upstate NY and a bunch of us went there one year deer hunting. I shot my one and only deer that year. Jimmy helped me pull the deer out of the woods. I have the "rack" (spike buck) mounted on a plaque in my den and when ever I look at it I see and remember Jimmy helping me drag the deer out. 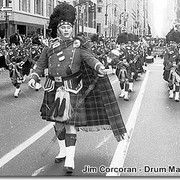 In 1962 the FDNY Pipe's and Drums was formed. Jimmy was a founding member of the band and was I believe the first Drum Major for the next 33 years. Former Chief of Department Kilduff said it best when he stated one year that the "FDNY Pipe's and Drum's are the Heart and Soul of the FDNY." I left 50 April 1973 when I was promoted to Captain. Assigned to 82 in September 1973 I continued to see Jimmy off and on for another 2 1/2 years. Left the 6th again May 1976 when promoted to Battalion Chief and worked my BC days in the 10th Battalion in Manhattan. But fate continued and promoted to Deputy Chief June 1980 my first tour as a covering Deputy was in the 6th Division with Jimmy driving me. Worked a number of vacation spots in the 6th until I went on the staff April 1984. Jimmy and I were working a 6x9 tour on March 16th, 1982. The war years were long gone but we still had a busy night, several fires and ended up at 0700 at a haz-mat job on a service road on the Cross Bronx. I remember asking Jimmy that with no sleep was he still going to march that morning. I remember him saying "chief, today (3/17) 5th Avenue belongs to us (Pipe's and Drum's and the FDNY) would take a lot more than no sleep to keep me away." I was doing a 6x9 tour on March 17th 1995. I walked into the firehouse and saw written on the housewatch blackboard 5-5-5-5 (Death of Member). Next to the 5's was written FF1 James Corcoran, Ret, L19/D6. I can not remember ever seeing the 4 5's for a retired member before. I called a friend who worked with the band and asked him how did Jimmy die and, was it before or after the parade. He said it was a heart attack and after the parade. The band finished marching as usual at 5th Avenue and 86th Street. They walked over to the downtown subway to go to the mid-town hotel for their St. Patrick's Day luncheon. Waiting on the platform Jimmy suddenly fell to the ground and despite their best efforts they couldn't bring him back. It would be hard to believe that the Good Lord didn't let Jimmy have his last parade. Rest in Peace Jimmy, was an honor and a pleasure to have known and worked with you. Worked a night tour in 50 on March 16th, 1971. The next morning 5 or 6 of us were going to the city to march in the parade. Several of us in our class A's were standing in front of quarters around 0930 when a civilian in a car drove up and yelled to us that there was a fire around the corner off Washington Avenue. I ran down to the corner and saw a heavy column of smoke off Washington. There was an alarm box on the corner (seem to remember box 2541), pulled it and waved to the guys to come with me. Found heavy fire second floor of an occupied tenement. I ran into the building and up the stairs. The fire apartments door was open and the fire was venting out and into the hall. At an apartment at the other end of the hall was a mother with two kids afraid to go out into the hall to the stairs. I just ran up grabbed a kid and pulled her and the other kid to and down the stairs. Went outside and we saw a man and woman at an open window in the apartment above the fire apartment. They were trapped in the apartment as the fire was venting onto the fire apartment fire escape. 50 and 19 were arriving. We took a 24' extension ladder off 19 and raised it (myself and several other off duty guys) to below the trapped people, we were short 5 or 6 feet. We then took a scaling ladder off 19. One of the guys, Bernie Casey, was lead on the ladder I backed him up. He raised the scaling ladder to the window and took the woman first, then the man out and down to the street. Fire went to a second with the fire apartment occupant DOA. We put the ladders back, went to the parade, marched, celebrated and came back and did a second night tour. I wrote Casey up, he received a Class B for the rescues. Once again Chief, thanks again for more great stories! I was working the St. Patrick's Day we lost Big Jim, I remember the guys returning to the firehouse after the parade with the sad news. We really lost a true legend of the job that day, but what better way for Big Jim to leave this world, then after leading the men up 5th Ave!!!!!!! May he continue to RIP!!! Worked a night tour in 50 on March 16th, 1971. The next morning 5 or 6 of us were going to the city to march in the parade. Several of us in our class A's were standing in front of quarters around 0930 when a civilian in a car drove up and yelled to us that there was a fire around the corner off Washington Avenue. I ran down to the corner and saw a heavy column of smoke off Washington. There was an alarm box on the corner (seem to remember box 2541), pulled it and waved to the guys to come with me. Found heavy fire second floor of an occupied tenement. I ran into the building and up the stairs. The fire apartments door was open and the fire was venting out and into the hall. At an apartment at the other end of the hall was a mother with two kids afraid to go out into the hall to the stairs. I just ran up grabbed a kid and pulled her and the other kid to and down the stairs. Went outside and we saw a man and woman at an open window in the apartment above the fire apartment. They were trapped in the apartment as the fire was venting onto the fir apartment fire escape. 50 and 19 were arriving. We took a 24' extension ladder off 19 and raised it (myself and several other off duty guys) to below the trapped people, we were short 5 or 6 feet. We then took a scaling ladder off 19. One of the guys, Bernie Casey, was lead on the ladder I backed him up. He raised the scaling ladder to the window and took the woman first, then the man out and down to the street. Fire went to a second with the fire apartment occupant DOA. We put the ladders back, went to the parade, marched, celebrated and came back and did a second night tour. I wrote Casey up, he received a Class B for the rescues. Near the finale of one of my favorite movies "State Of Grace" there are several clips of The Band marching on St Patricks Day led by Big Jim Corcoran RIP.